The recreational facility, which is surrounded by woods from three sides, is located on the edge of Hluboká nad Vltavou and offers the accommodation of all categories: in the hotel, where are double and triple rooms with own facilities and the possibility of the internet connection, total capacity 52 beds; in the hostel, where are 5-bed or 6-bed rooms with facilities shared on floors, total capacity 31 beds, in bungalows – 5-bed chalets with own facilities and a small kitchen, total capacity 30 beds, and in the campside – the part of the areal is possible to use for own tents or caravans. This objekt is very much suitable for company training and events. There are an out-door swimming pool, a sauna, a large fireplace, a roofed terrace, a playground. The possibility of sport realization (diving, quadricycles, kayaks,…) and car park in a locked areal. If you are looking for a "private accommodation in Lipno", you will certainly find a homely pension "U Procházků", in the village of Hůrka on the coast of Lipno, a great choice. It is suitable for active holidays as well as for those looking for accommodation for children in Lipno. Your cars will be parked directly by the pension where you can also find all necessary facilities for your relax: a swimming pool (a pension with a pool in Lipno), a minigolf, a table tennis (rackets and balls are rented for free), a fireplace with a grill, swing-lows for children (holidays with children in Lipno), treddles and a boat for fishermen. There is a Šumava cyclo path directly around the pension, it means accommodation for bikers Lipno. Hotel Racek offers accommodation in Černá v Pošumaví, in one of the most popular recreation areas of South Bohemia. Because of its location and wide range of services it is determined for relaxation and active holiday in Lipno in both summer and winter. The hotel went through a partial reconstruction of accommodation and gastronomy rooms, and will satisfy even the most demanding guests. In the restaurant you can enjoy traditional Czech cuisine and specialities, refreshing beer or quality wines. At the restaurant there is a terrace with spectacular views of the lake Lipno and the surrounding hills of the Bohemian Forest. The restaurant is with its capacity and dispositions (terrace, sitting at the bar, two separate lounges) suitable for social events and workshops (corporate events in Lipno, celebrations and banquets, weddings, teambuilding). 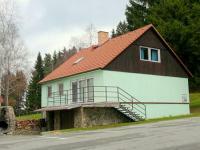 The family pension U Méďů provides the accommodation in the Bohemian Forest near the Lipno lake between the towns Černá v Pošumaví and Horní Planá during all year. The environment is ideal for family holiday and business events and schoolings at the Lipno lake. The Bohemian Forest, the Lipno lake and the whole area around Lipno are the guarantees of the active and passive rest: cyclotracks and cycling in the Bohemian Forest, swimming and water sports at the Lipno lake (windsurfing, kiting, ice-skating in winter), skiing in the Lipno ski-areal and in Hochficht (we ensure the trasport – skibus and skipasses), signed trails for cross-country skiing, mashrooming in the Bohemian Forest, bob slide in Lipno, possibility to visit the towns Český Krumlov, Vyšší Brod, Rožmberk and others. Penzion Horfa is situated in a small village Slavkov in a pictureque countryside 13 km west of Český Krumlov (accommodation near Český Krumlov). During all year long it offers accomodation for lovers of nature, hiking, sport and mashrooms (active holiday Slavkov). In surroundings you can find plenty of attractive destinations for your trips - towns Český Krumlov or Vyšší Brod, lovers of water sports and fishing can start for the lake Lipno (fishing Český Krumlov area). We arrange for you seminars, celebrations or other group events. 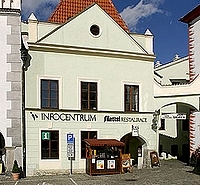 Pension Maštal provides accommodation in the square in Cesky Krumlov. 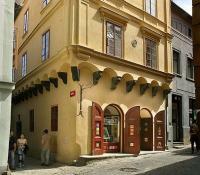 The small friendly guest house is situated in the center of Cesky Krumlov and offers views of the castle. Rooms are equipped with bathroom with shower, TV + SAT, internet access and a kitchenette apartment. Breakfast is served from 8:00 to 10:00 a.m. in the restaurant Pod Radnicí, which is located approximately 20m from the guesthouse. Besides comfortable accommodation in Cesky Krumlov we will arrange a boat or bicycle rent. Keen anglers can use a private lake situated 10 km from the town. Newly reconstructed Pension Thallerův dům is situated in the historical center of Český Krumlov. Accommodation with a distinctive atmosphere is guaranteed in seven comfortable apartments. Most rooms offer their guests a beautiful views of the castle - our guest house is ideal for romantic stays in Cesky Krumlov, whether you spend the whole week or weekend here. Each room is equipped with a kitchenette, bathroom with bath or shower, television, satellite and internet connection. Breakfast is served from 8:00 to 10:00 a.m. in the restaurant Pod Radnicí which is located about 20 meters from the house. Landal Marina Lipno offers luxury and cosy accommodation in Lipno directly at the lake, in various types of accommodation: from smaller studios to a spacious apartment with five bedrooms. The apartments are fully equipped (satellite TV, an equipped kitchen, a bathroom with a tub and toilet, a balcony or a terrace to sit on), Apartments for families in Lipno. It is an ideal place for family stays in Lipno - there is a children´s corner with a wide offer of creative activities in the premises, Holidays for families with small children Lipno. There is a public swimming pool with a whirlpool and a children´s pool in the premises, a sauna, massages, minigolf, table tennis, a solarium and a covered children´s playground (sauna and massages Lipno) - accommodation with pool in Lipno. Holidays in Lipno, that is a possibility of active relaxing (active relaxing in Lipno) and a pleasant relaxation at the lake, Relaxation in Lipno. A couple of restaurants are a part of the premises, which offer breakfast (open buffet), Premises with restaurants Lipno and its surrounding.